Blue studs: gotta catch 'em all! Do you find it interesting how desperate people are to watch Breaking Bad? The show, which has not been on air since September last year, induces a craving among its fans that leaves them in a breathless, sweaty panic as they wait for more. If this describes you, than we may just have something to tide you over until your next taste of the hit series. 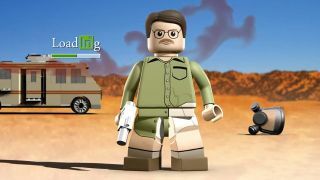 An animator has posted the product of many weekends on YouTube this week, a re-imagining of Breaking Bad in the style of the Traveller's Tales Lego video games. Not a parody, but a loving recreation of a few classic scenes from the show, the video shows stud-busting gameplay and even has faux Xbox achievements. Its creator says that after all of the work of putting it together, it took 60 days for his computer to render the finished product. I should introduce it to my computer, which spends all its time looking up goofy cat pictures and watching videos on YouTube. Hear that? That's the call of more blips coming over the airwaves. Might want to tune in.